Valuing some people more than others is unethical. Maintaining barriers to some students’ participation in the cultures, curricula and communities of local schools is unacceptable. Preserving school cultures, policies and practices that are non-responsive to the diversity of learners perpetuates inequalities. 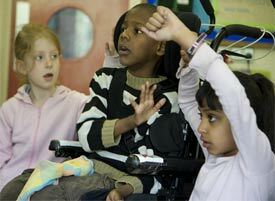 Thinking that inclusion mostly concerns disabled learners is misleading. Thinking that school changes made for some will not benefit others is short-sighted. Viewing differences between students as problems to be overcome is disrespectful and limits learning opportunities. Segregated schooling for disabled learners violates their basic human right to education without discrimination. Improving schools only for students is disrespectful to all other stakeholders. Identifying academic achievement as the main aim of schooling detracts from the importance of personal and moral development. Isolating schools and local communities from one another deprives everyone of enriching experiences. Perceiving inclusion in education as a separate issue from inclusion in society is illogical. People often have views on inclusion but little time, energy or inclination to explore them. The issues are not simple and answers are far from straightforward. Nonetheless, CSIE strongly urges visitors to this site to make time to grapple with these ideas: to interrogate your views, challenge your thinking, expose and investigate assumptions, try to see things from a number of different perspectives. Be relentlessly curious: how might these issues look if you were a teacher, a parent, a young person? What might it be like if you were experiencing barriers to your learning or participation? The issue of including disabled learners in mainstream schools has been so heavily contested that it seems to warrant closer consideration. Find out more about including disabled children in mainstream schools and read our responses to frequently asked questions on this issue. We have also put together some responses to frequently asked questions about schooling for lesbian,gay, bisexual and transgender children and young people.